In 2018, Far Cry 5 took players into Hope County, Montana, a rural landscape under control of the maniacal cult leader, “The Father” Joseph Seed. This February, Far Cry New Dawn takes us back to the same place, but it is now a post-apocalyptic world. I had the opportunity to play a preview of Far Cry New Dawn at a Ubisoft event, and was just as invested in liberating Hope County as I was in Far Cry 5. As a direct sequel in the same world, parts of the game felt safe and familiar, but the evolved narrative, novel gameplay mechanics, and teases of what happened to the Father kept me engaged. If you beat Far Cry 5, you have a good idea of why Hope County is now in a ravaged state. Even if you haven’t, Far Cry New Dawn is a standalone game that technically doesn’t require you to have played its predecessor. You’d miss out on references and will get spoiled on Far Cry 5’s story, but I appreciate that New Dawn carves its own identity. Only 17 years have passed, but the circumstances have completely changed. The world has experienced the apocalypse following certain events, and the few survivors have set up a home base, Prosperity. You play as the captain of security, a custom male or female avatar, much like Far Cry 5’s deputy character. As luck would have it, your superior Thomas Rush has been captured, and it’s up to the player to once again stop a new threat: the dangerous Highwaymen led by the tough-as-nails twins Mickey and Lou. The twins look and act deliciously evil, and I am excited to see how they will develop, witness their relationship, and learn more about their underlying motives. The demo began in Prosperity, but I was free to explore the area north of it. 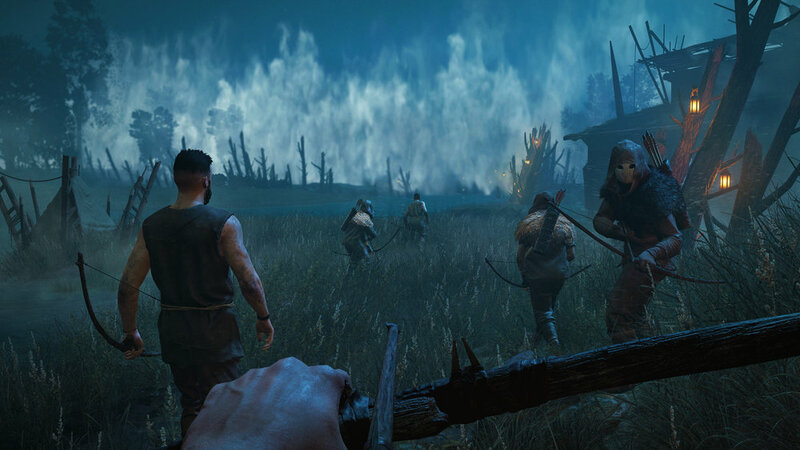 Many gameplay elements are similar: a large world to explore, missions and sidequests that typically involve shooting numerous foes, and a progression structure that rewards achievements. It’s the contrasts and throwbacks to Far Cry 5 that stand out most in terms of differences. Hope County is in a post-apocalyptic state, and yet it’s eerily gorgeous and bright. Nature has overtaken the frontier, flowers crown the vast fields, but everything feels so quiet, as if implying a foreboding presence. I did see some pockets of true destruction – a forest of dead trees on dried up ground with poison clouding the air. The world layout will indeed be familiar to veterans, but the atmosphere is different enough to evoke a drastically changed land. The fast electronic music beats remind me more of spy missions than the acoustic guitar from the previous game, but it felt thematically appropriate. Prosperity, the survivors’ refuge, is more of a home base than the major towns in Far Cry 5. There are multiple facilities within that directly assist the player. For example, the healing garden improves medkit efficiency, and the cartographer provides intel maps. You can use the resource ethanol to upgrade any of these services, so improving the infirmary will further increase your max health. The workbench is a particularly interesting facility that allows you to craft new weapons using loot, which adds a nice RPG touch. Speaking of which, enemy ranks also introduce light RPG elements. The villainous Highwaymen have three levels, as well as an additional special rank for reinforcements. Higher ranked foes have more health and are generally tougher. The goal is to avoid being outranked and eventually strengthening your character to outrank enemies. Nonetheless, it feels so satisfying take one of the big guys out as an underdog. From Prosperity, I set out on my first mission to save my superior, Thomas Rush. Joining me was a familiar friend, Carmina Rye, daughter of Kim and Nick Rye from Far Cry 5, born during one of that game’s most memorable missions. Seventeen years later, Carmina is now a Gun for Hire, an ally who travels and fights alongside you. Unfortunately, she went out of commission within minutes of leaving the base because a gigantic boar rammed her. Reviving her required resources I didn’t have, so I needed to find a new partner. And just as with good dog Boomer and lovable diabetic bear Cheeseburger from Far Cry 5, I gravitated towards saving an animal buddy. Timber the dog was trapped in a caged animal prison, in which detestable men were running experiments on the poor canines. Using a mixture of stealth and grappling hook (which I had to unlock by spending my limited perk points), I not only rescued Timber but freed the rest of the dogs. It’s tough but worth it to pet the faithful dog and add it to my team. The mission to save Thomas Rush was a similar endeavor. I had to sneak into an enemy stronghold, then fight my way through troops underground, only to find the captured Thomas Rush beating up his captors. It’s a fascinating introduction that culminated in an intense car chase where I had to shoot at Highwaymen while Rush floored it. Upon returning to base, the next mission was to upgrade Prosperity, which required saving two specialists and upgrading three facilities. Looking at my map, which filled itself over time, I noticed some familiar Far Cry 5 characters, who acted as the specialists, such as Grace, Pastor Jerome, and Hurk. The end of the world has no doubt affected these characters, and it was interesting to see how they’ve changed and adapted. Most intriguing of all were a set of photographs I received showing areas of Hope County as it was years ago. By holding a photograph up at the corresponding area, you can witness how Hope County has changed. Most importantly, you can find out more about what happened to the previous game’s antagonist Joseph Seed, as well as the original protagonist, the deputy. The creative director even teased that going to a certain crucial island where Far Cry 5 began would offer a deeper insight into “the Father’s” fate. This mystery was what I was pining to find out the most. Joseph Seed was a great, troubled villain, and I really wanted to discover what he thought of a world that resulted from his actions, as well as ascertain his stance of the Highwaymen, a new threat that even he himself seems to oppose. Back to the gameplay, I got to experience part of the game with a co-op partner, which went smoothly. Together, we liberated outposts in an effort to obtain ethanol, the resource necessary for base upgrades. You can now scavenge outposts, allowing them to get recaptured. This not only nets you more needed ethanol, but offers the opportunity to take down a more difficult and beefed up outpost, with more rewards lying in wait. My playthrough of the demo ended with an expedition, an adventure to another area of the country. Each expedition takes place in a new self-contained map, and the mission is always to track down a package and bring it back to a helicopter. These segments help bring the focus away from the rural Hope County and explore new locales. such as a large ghost ship in Florida or the Navajo Bridge near the Colorado River. I appreciate that expeditions also expand the lore, showing what is happening throughout the country and establishing the apocalypse as a global disaster. There’s more under the surface to Far Cry New Dawn, but I can safely say that it brought back fond memories of the fun I had exploring Hope County in Far Cry 5. It’s a familiar world, and not every veteran may want to retread new ground. However, those who enjoyed the previous game and are waiting with bated breath to find out what happened since Far Cry 5’s jaw-dropping ending may consider going back for round two. 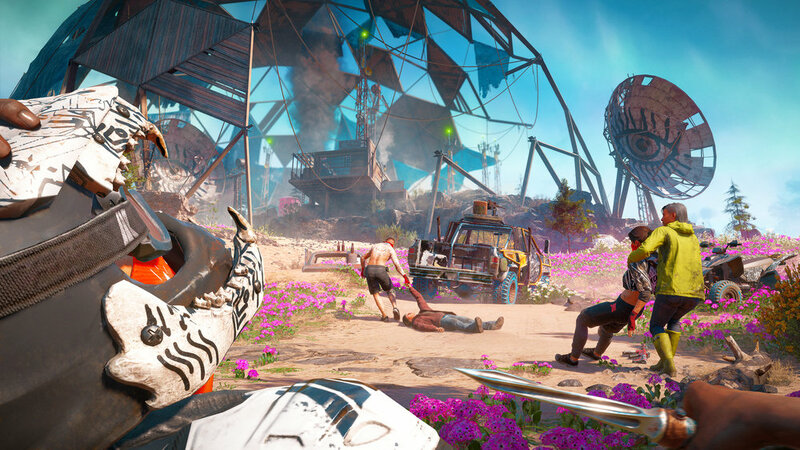 Players can return to a post-apocalyptic Montana when Ubisoft releases Far Cry New Dawn on February 15, 2019.